Men, you might as well stop reading now. I have discovered one of the best inventions ever. 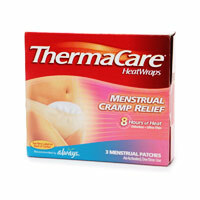 The ThemaCare Heat Wraps. You know how you just want to lay on the couch with a hot water bottle or heating pad when AF comes for a visit? This is like a tiny heating pad that you can wear around for 8 hours! They are glorious, and I can't believe I didn't try them sooner. They are $9 for a pack of three, but I think it is totally worth it! I've heard of those before, and I always wondered if they actually worked!